This Bible study guides wives through a 5 step plan to understand and attain a gentle and quiet spirit, which might be different than what they expect. It is especially useful for Type A Personalities to discover that it's not about being quiet and demure. What is a gentle and quiet spirit, as described in I Peter 3:3-4? How do we attain a gentle and quiet spirit and still allow for the liberty and freedom that Christ teaches, the creative beauty of individual personality that God created and ordained, the equality of the genders granted by the laws of the land, recognizing differences in natural temperament, while living within and influenced by current cultural norms? How do we encourage each woman to shine in the beauty in which she was created, whether as a gentle and quiet daisy, or a flamboyant and fabulous hibiscus? What does gentle and quiet look like, and how do we attain it? 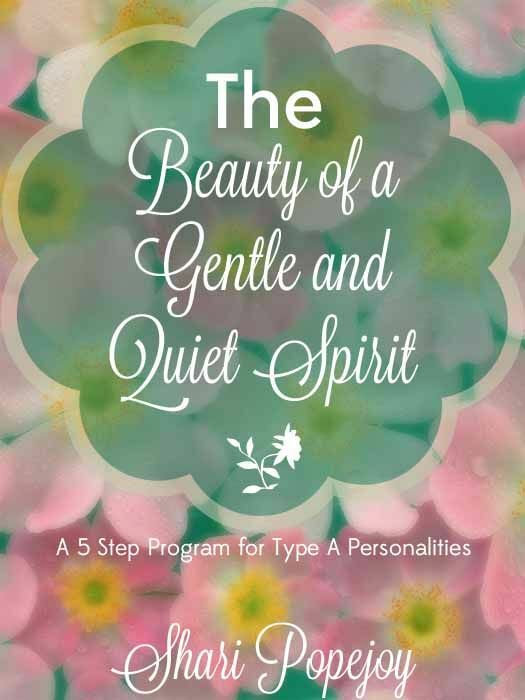 This study guides a woman through a 5-step plan to understand a gentle and quiet spirit, and is especially useful to those with a Type A personality!